Up and down the country there is an ongoing debate regarding new build residential sites, we know we need many more new homes but should the roads or the roofs come first? Increasingly, buyers of new build homes are emphasising the importance of key infrastructure elements such as roads being in place before they purchase their property. Across the UK, buyers are complaining about lack of streetlights, hazardous incomplete pavements and unfinished roads that lead to flooding and other problems. The issue is exacerbated by the current legislation. Councils can ask developers to enter into a Section 38 Agreement in order to ensure that roads are finished to an agreed standard, but they cannot force developers to do so, resulting in many buyers of new build homes ending up frustrated that their roads, pavements and streetlights sometimes remain unfinished years after they have purchased their new property. 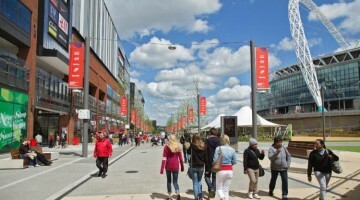 At Wembley Park in north-west London, developer Quintain has turned the situation on its head. The massive revitalisation of Wembley Park will see some 5,000 new homes added to the area in total, several hundred of which have already been built, sold and are occupied. 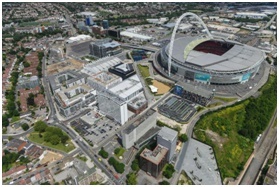 The SSE Arena, Wembley (with a capacity of 12,500) and Wembley Stadium* (with a capacity of 90,000), have together ensured that Wembley Park is an area that is already more than fit for purpose when it comes to its transportation infrastructure. It means that whilst technically in Zone 4, residents can travel in to central London and out to the shires incredibly quickly. On event days, 100 trains per hour run through the three Wembley stations that service the stadium. Wembley Park also offers an excellent array of shops, schools and restaurants, as well as its impressive transport credentials. London Designer Outlet draws in shoppers and diners from across London and the surrounding areas, while local residents and workers delight in the weekly gourmet food market. In the heart of such excellent and established infrastructure, the homes for Londoners that are springing up have been understandably popular. At the beautiful Pienna Apartments building, which is part of Alto Apartments, one bedroom apartments are available from £415,000 and two bedrooms from £550,000. Almost every apartment enjoys its own private outdoor space or balcony, while a residents-only courtyard garden offers a further means of enjoying the great outdoors. An on-site gym with spa treatment rooms, a concierge service and car club membership are all included in the price. 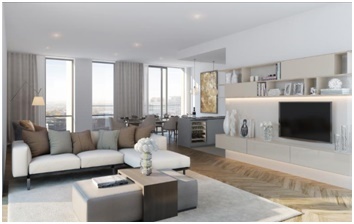 Wembley Park epitomises the benefits of taking a proactive approach to development and ensuring that the infrastructure is in place to provide home owners with true satisfaction from the moment they move in.